Along with preparing for Graduation day, I have been running around getting estimates for granite, a tile backsplash, window cleaning, etc after meeting with Realtor # 2. I had not done a single project in a couple of weeks until today! Thursday I stopped in at Marshall's looking for a dress for Graduation...yes I know it was last minute, but I found a cute one, so it all worked out. Anyway, I also found this wrought iron planter ... which was the same one that I had wanted for Mother's Day 09, but by the time Mr. Fanatic arrived at the store, it was gone. So, I was extremely happy when I found it!!! It will add more color on our deck that was spruced up a couple of months ago. You can read about it here. I already had 2 pots to put in it, but 3 could fit in the top part of the planter, so I went to Lowe's & bought one more pot and some plants. Then I taped them up, spray painted the rims, then painted the bottoms with a metallic craft paint. A very lovely addition to my decked out deck! Thank you all for stopping by. I promise I will stop by and see you, too! Very nice Pam! I love how you did the rim red...ties in great with all your other decor. I have missed you on here...but I know how busy you are. My boys are home now too for summer....it's going to be a long hot one! Congrats to your daughter! 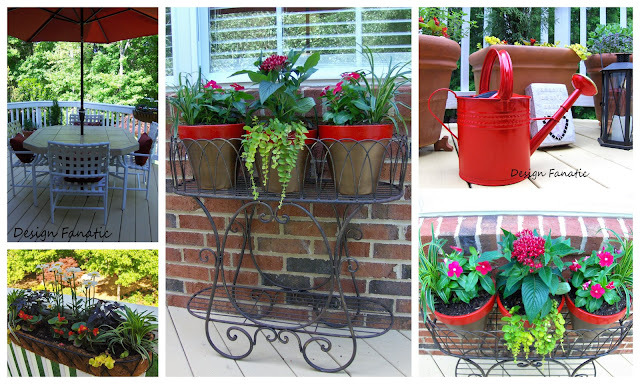 Love the iron planter and various shots from your garden! Pam, I have missed you around these parts. Good to have you back. Love that planter and your pots look great. The planter is adorable and graduate a beauty ! Congratulations !!!! Love the planter. Looks great with everything else on your deck! Very nice. love the colors you painted your pots, they look wonderful in your new planter. Beautiful planter! I love how you painted your pots too! It looks so elegant! I remember how hectic is with graduation, we did that 2yrs ago with our first! I know you are busy with trying to move and all but I hope to see more of your posts. I've just started following you and I love your style! I'm your new follower, come see me, too! What a great stand. I love wrought iron and the potted flowers look great also. Found your blog on met. monday. I blog about gardening, flowers and our landscape. Stop by for a Latte' sometime. Happy blogging! Hi, great pictures and mosaic! I hope that you have a lovely new week! I found you at the Girl Creativ'e Linky party. I love your planter and your pot transformations! These would be a great project to link up to my upcoming garden party June23-25! I'd love to have you join us, there will be some fun giveaways as well! Congrats to the whole family... the twinkle in their eyes is VERY fun! ooooo I love it. and I love your paint job on the pots. AND I LOVE YOUR RED WATERING CAN! What a beautiful look on your deck. Thanks for sharing the inspiration. Super job!!! That is adorable. Congrats to your daughter on her graduation. I love your blog. You have some fantastic ideas! Its a beautiful planter. Great idea!